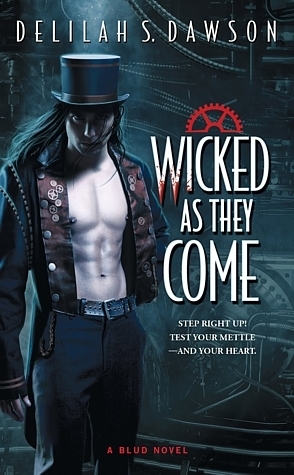 First in a steampunk-tinged paranormal romance series in which a woman is transported to a world filled with vampires and magic. When nurse Tish Everett forced open the pesky but lovely locket she found at an estate sale, she had no idea she was answering the call of Criminy Stain, from the far off land of Sang. He’d cast a spell for her, but when she’s transported right to him, she’s not so sure she’s ready to be under the spell of another man. (It didn’t go so well last time with controlling, abusive, domineering Jeff.) If only Criminy wasn’t so deliciously rakish…. Are you ready to step through the looking glass, right into a Vampireland…er, I mean Sang? “…contemplating the dark possibilities of a forest where Snow White had more to fear from her animal friends than from any wicked queen.” (p. 162). Tish, or Lady Letitia, Fortune-Teller as she becomes known, has no choice but to join the traveling circus, whose master is none other but our mysterious gentleman: Criminy Stain, Gypsy King. (Ok, I admit I’ve rolled my eyes a few times while reading the novel, just because of his name. It is somewhat fitting within the whole world building but “Criminy,” really?) As Tish reluctantly starts to accept her new reality, and contemplate her options of getting back to her own world, the slow beginnings of a relation between the two main characters start to sprout. Through numerous endearments, such as “love” and “pet”, which is how Criminy insists on referring to Tish throughout the novel, (which also irked me to no end); we meet the various carnivalleros of the Criminy’s Clockwork Caravan, whom I found to be quite interesting, unusual and at times very colorful characters. Thereafter, the adventures commence, and armed with their magical abilities and convenience of occasional use of Tish’s blood as currency, the two travel the lands of Sang, through various events, trying to recapture the mysterious locket (that of course, gets stolen at the first opportunity), so that Tish may return to her world, while also saving the Bludmen (i.e., vampires) of Sang. Well, you get the idea: at the end love conquers all, cause nobody likes to read a sad fairytale. Personally I am not a big fan of circus, and thought I wouldn’t enjoy the story as much when the said circus was introduced, but surprisingly I did. It added an interesting layer to the story, a bit of magic, and a fairy-tale feel. In fact, I think I found the whole novel to be very much like an interesting mix of some of the great fairy-tales: a dash of Alice’s Adventures in Wonderland, a drop of The Little Scarlet Flower (which is essentially a tale of Beauty and the Beast) and perhaps something else unique, and steampunk to boot. 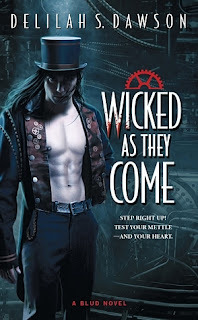 Overall, I think Ms. Dwason has offered a captivating debut novel and if you are also on a lookout for a great PNR/Steampunk read this is the one for you! Perhaps, my biggest problem with this novel was that I didn’t fall in love with the main characters. I didn’t relate to Letitia, nor Criminy for that matter. Letitia either cries, whines, faints, sleeps, or pretends to be fearsome and motivated, but that is usually short lived. Criminy underwhelmed as the love interest. He was not very gentlemanly, or hero-type. And even, the long awaited love scene on the submarine (oh yes! There is a submarine involved.) fell a bit short in my opinion. Plus, I couldn’t get past the black scales covering his hands (which is the general attribute of the Bludmen in the series). I kept hearing the Doors playing in the background while reading the novel, hence the lyrics of the “Spanish Caravan” in the beginning of the review. In general, the lyrics of a few of the Doors’ songs would’ve fit quite right within this novel: “People are Strange” or possibly, “Hello, I Love You,” don’t you think? hahaha, great review, V..! I admit for me this book had a much better appeal than for you because Criminy reminded me of Spike, and I love Spike.Plus all that love and pet is the least you can hear in England. Very British. I've been called that, plus sugar, duck and cocker... ;) Go figure. I did still enjoy it...(reading the 2nd one at the moment), but certain moments definitely were not up my alley. :) I'll take your word for it on all those "love" and "pet" references - haha I think even Tish makes a comment that to her ears it sounds strange. I guess after all we get Americanized ;) "hun" is much more common around here. It's all good. There wasn't as much of that in the second book though! Speaking of which - gotta go write that review.